Clear and concise, The Only EKG Book You'll Ever Need has provided quick and accurate discussions on using an EKG to diagnose cardiac and non-cardiac conditions for nearly 30 years. This ninth edition is packed with full-color illustrations, real-world clinical scenarios, and step-by-step instructions—giving you the practical guidance you need to use an EKG in actual clinical settings with patients. Outlines processes for identifying and interpreting arrhythmias, myocardial infarctions, hypertrophy, atrial fibrillation, and other disorders. Features a lighthearted, lively writing style designed to be compelling and minimize confusion of principles discussed. New content added to reflect recent clinical and technological advancements. Depicts real-life clinical situations and provides important clinical context for EKG use. Advises on the dangers of over-reliance on computer interpretations and includes many other practical considerations that other books leave out. 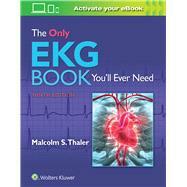 New EKG cases available in the companion eBook illustrate key concepts discussed throughout the book.